Eleaf Pico Squeeze 2 Kit with Coral 2 Atomizer, which is powered by 18650 or 21700 battery to fire up to 100W, has 0.49-inch OLED screen to clearly show status of vape. It includes several output mode to deliver different flavor. 2A quick charge is helpful for saving your time. Eleaf Pico Squeeze 2 Kit with Coral 2 Atomizer, which is powered by 18650 or 21700 battery to fire up to 100W, has 0.49-inch OLED screen to clearly show status of vape. It includes several output modes, such as Ni, Ti, SS, TCR, VW and bypass, to deliver different flavor. As regards atomizer, it is suitable for 22mm and 25mm. Furthermore it adopts lighting effect for squeeze bottle and honeycomb resin drip tip to offer excellent tactile impression. 2A quick charge is helpful for saving your time. Just get this vape with unique appearance and bright color. • Three-month warranty for Pico Squeeze 2 Mod and Coral 2 Atomizer. • Quick links:Coral 2 RDA,Pico Squeeze 2 Mod. It's great that this eleaf box kit has battery. I don’t bother to buy. I searched many squonking device and finally picked the pico squeeze 2 based on the good comments of the first generation pico squeeze. Good battery life, large juice capacity, compact size, beautiful appearance. I am very satisfied with it so far. Recommend! BuyBest have the latest kit,many in best price.Highly recommed more friend buy e-cig here! Pretty drip tip, very easy to build and easy to use, battery life is excellent. This is my first squonk kit. I have to admit I am totally in love with it now. I haven't refilled e-juice for two days, which saves a lot of trouble. Suppprting both 18650 and 21700 is a plus. And I am surprised that a 21700 battery already included in the package, so I don't need buy separately. The coral 2 works perfectly with the pico squeeze 2, providing nice flavor. superb squonker. I tried to look for a squonker and I bought this. I am all satisfied,very cool and long battery life. 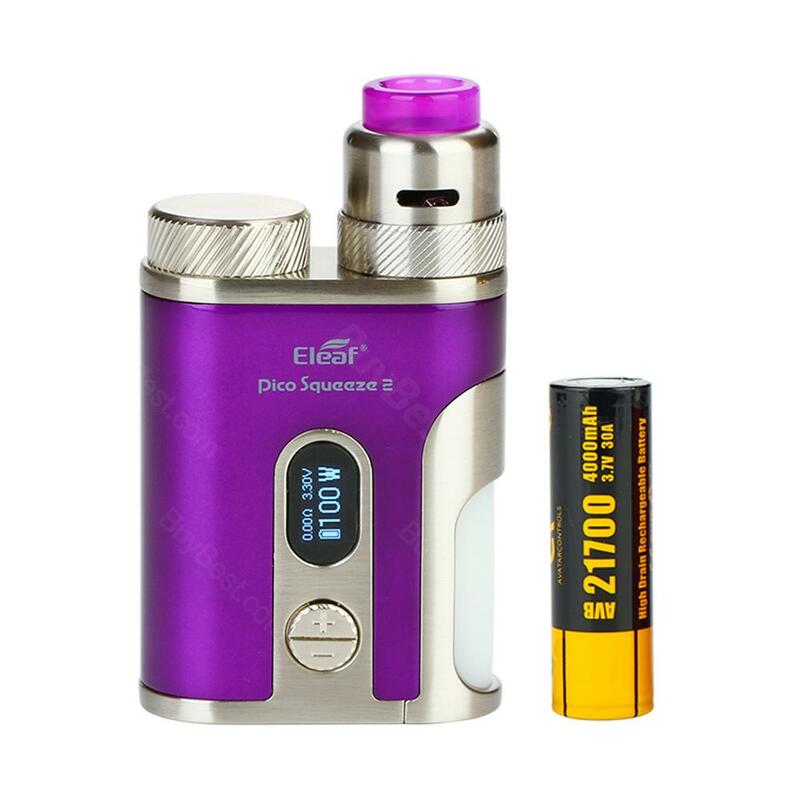 Pico series have similar design; this Pico Squeeze 2 Kit is the most beautiful. Fast delivery with four weeks, arrived without any damage. Small mod have 2A quick charge,can meets me different flavor.The most commonly used kit now! Battery life is much better than the original pico squeeze. Reasonable price and best service.18650 and 21700 battery also well,large battery can last long. large 7ml E-juice squonk bottle,i can use it about all day.Taste and smoke are great! Дизайн Eleaf Pico Squeeze 2 Kit мне понравился и цена ниже чем у других магазинов! Design and Build Quality are all good, easy to set up and use except it's kind of heavy, but I can live with it. Love my pico squeeze 2 kit, the squonk bottle can hold up to 7ml e-liquid, pretty enough for my days of vaping and it's very easy to press. It's definitely a good chioce for anyone who wanna start squonking. it's a must-buy product, I will let all of my friends drop by! Buybest is the best place to get your vape.